Showers and Flowers are often associated with April. The gorgeous blooms grown by Don Vinguault grace our meeting this month. As we enter into the rebirth of this year we reflect on those who may not be in the best of circumstance. We are in serious conflict overseas. 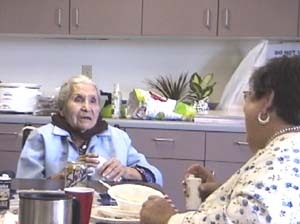 Our relatives and warriors in harms way are frequent topics of the table conversation, our tribal seniors enjoy and recall the beauty of youth and realize the wisdom gained by experience and knowledge is priceless. Jerry Starns arrived early to help setup the room for the meeting. He plugged in a crock-pot full of beef stew while I put the coffee on to brew. 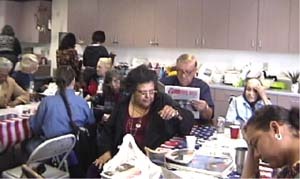 I had to leave for a bit and when I returned there was a full room of Members talking and enjoying each others company and reading the tribal Indian Voices. Rose Davis, publisher of Indian Voices, is here with her daughter, Serena. Perfect timing, potluck was just starting to form up at the counter. I got two plates together and sat Mary O. Cook, my Mother, at one of the tables while the business of the meeting and the eating were falling into to place. Easter Abrahano, President, had her granddaughter with her and Vickie Gambala, Treasurer, had zipped over from taking care of her granddaughter Mellisa. Jane Dumas, Vice President, is on her feet and feeling good. She assigns tasks and reviews old business for the membership to approve and comment on. Our secretary, Helen Razo, is very sick and the membership assigns the responsibility of the office to Roy Cook. In fact before the meeting is ended a call is received that announced Helen is once again being taken to the hospital. We pray she recovers and will continue to bless us with her courage. 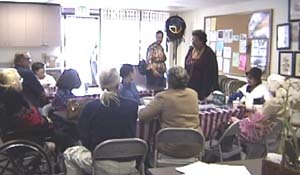 Jane Dumas, attended the Mayor’s advisory meeting and reported on the proceedings. Further, Jane announced the TONKAWA club might award a Lifetime membership to Ruby Teton for the years of dedication to the TONKAWA mission. She further presented the TONKAWA newsletter to the membership and many indicated they would like top receive a physical copy at their home. 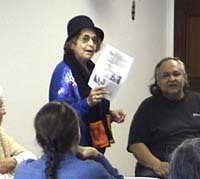 The TONKAWA proceedings and past newsletters are available 24 hours and seven days a week on the World Wide Web, americanindiansource.com. Action item: Requests for participation must be submitted in writing for the consideration of the membership. Terms of usage and fee consideration need to be addressed before the occasssion. No crisis management will be tolerated. Plan ahead for success and reduction of stress and hard feelings. Community needs take priority over individuals’ desires. Don’t shoot me; I’m just the messenger! New and first time members were well pleased with the warm reception. Timing is perfect for new membership, according to Jane Dumas, the TONKAWA membership year runs from April to April of the next year. Associate and regular membership is still $5.00 a year. Check your Easter baskets for next month’s dues. Note next month TONKAWA club change of date - MAY 4, 2003. We sang birthday songs for all April babies: Esther Abrahano and Ron Morton in particular. Don Vigneault took the reins for the gift exchange. Finally, we bagged, bundled and cleaned up the Chester Hunt meeting room at the Many Nations Recovery Center to finish up another fun, fabulous, TONKAWA club time with the most beautiful people in the world, Indian people. Mehan.